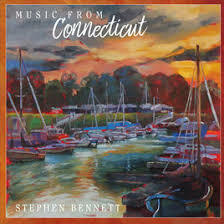 Bennett has performed around the world, shared the stage with some of the finest guitarists, and created a body of work that is respected and loved. 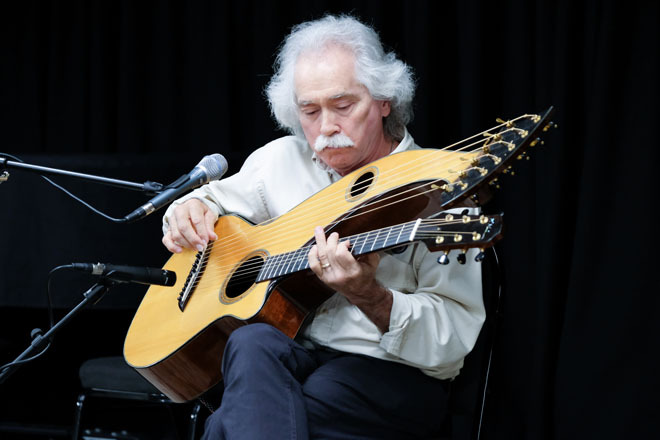 He is the founder of the Harp Guitar Gathering, an annual event that brings players, luthiers, scholars and fans of this instrument together for a weekend of performances, workshops and camaraderie. Stephen Bennett will be performing Saturday, March 24, 2018 at NAMM’s Museum of Making Music in Carlsbad, CA. How did the idea of “Reverie” come to you? “Reverie” is one of those tunes that just came to me without any direct inspiration. I was just doing what I sometimes do, sitting with the instrument, trying to keep my mind as open as possible so that the music could reveal itself. It was around 2006, my marriage wasn’t going well (it was about to end), and that probably played into it. You play many instruments. 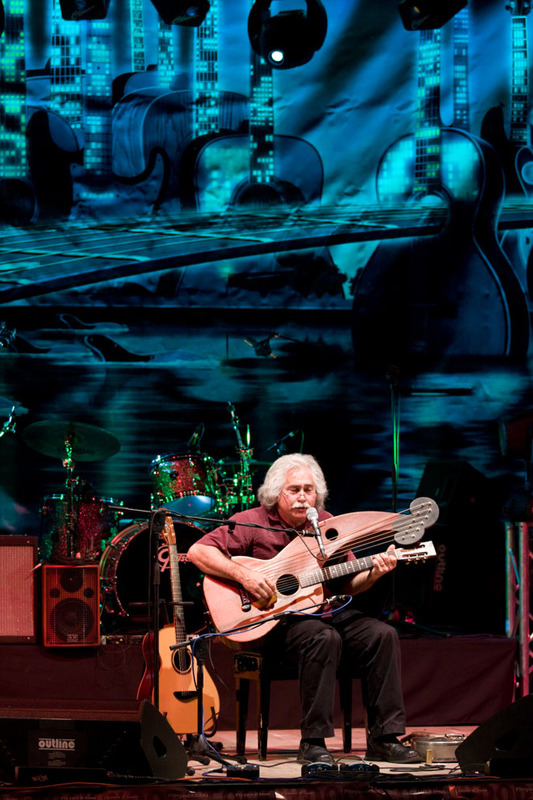 How does the harp guitar expand your musical palette? How did the album Music from Connecticut evolve? Why did you start the Harp Guitar Gathering? 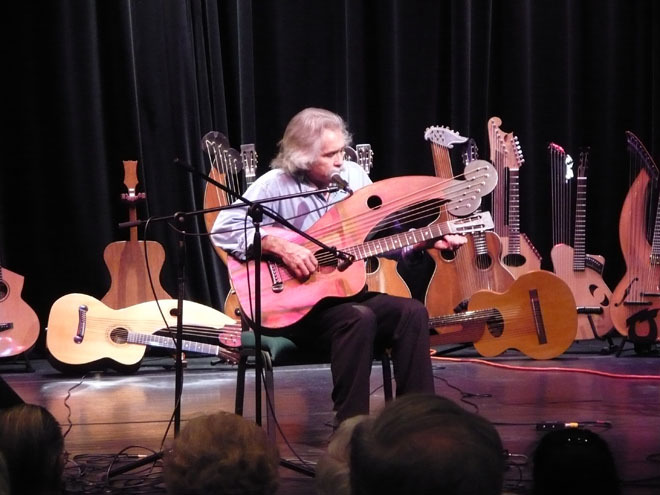 What is now the Harp Guitar Gathering was originally conceived as a one-time get-together of people I had come across in my travels and online, who had some connection to these instruments: Gregg Miner, John Doan, Andy Wahlberg and Bob Hartman. I wrote to them and others, and asked if they’d like to come to Williamsburg, VA for a weekend get-together. I said I would organize it and arrange for a public concert that we’d all play, with any proceeds going toward expenses. To my surprise, every single person said yes. We got together in the fall of 2003 and had a great time. It was a great experience for all. Players who hadn’t really run into anyone else who played the instrument now realized that we were not alone. As the weekend wrapped up and it was time to say goodbye, we all kind of looked at each other and realized we had to do it again. 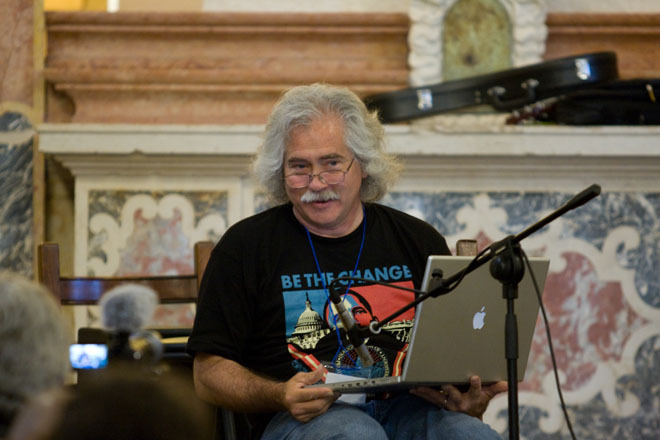 The 16th Gathering will be this October 12-14, 2018 in Milford, CT.
Top 5 musicians who inspired you to compose and play? The Beatles: amazingly, their music still sounds as great to me as it did 50 years ago. Yes: Steve Howe was brilliant. 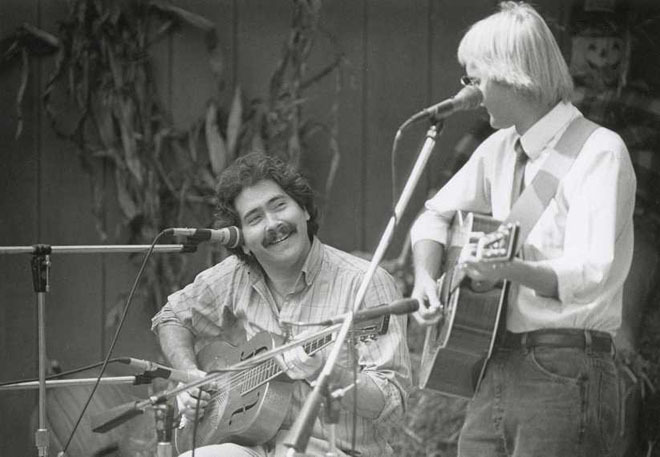 Leo Kottke: I heard his album Greenhouse on my first night away at college, and it knocked me out. Tommy Emmanuel: I was at the Chet Atkins Appreciation Society Convention in 1997 when I heard him play for the first time. The power and beauty of what he was doing knocked me out. It’s not like I was a slacker—hey, I was an invited player there too. But hearing Tommy made me dig deeper and try harder. How did the idea for “The Eye of God” come to you? I was sitting with harp guitar in hand while looking at photographs taken by the Hubble Space Telescope. They were amazing. There was a photo of the Helix Nebula that looked like an eye. The astronomers called it the “Eye of God.” I hit the opening three-note chords and damped it. The resulting resonance of all the overtones that had been triggered was magical. So I repeated it—over and over. And over. (Laughs) I started changing the chords and that was it. Once that first chord had been heard, there was no turning back. When I get an idea that won’t go away, I interpret that as a gift from God, or the Universe, or whatever else you choose to call it. I accept it as my responsibility to do my best to bring it to fruition—to make of it what I think it wants to be. What composing tip you would you like to offer? Tell us one time something unique inspired you to compose music. I could tell of many such experiences, including reading American Holocaust by historian David Stannard. The first-hand account of the Spanish conquest of the Aztec city of Tenochtitlan resulted in my tune of that name—almost instantly springing into existence on my harp guitar. The realization that the musicians were first to be killed that day—really hit me. Which instruments/equipment can you not live without? My primary instruments now are a harp guitar made by Kathy Wingert, a 6-string made by Max Monterosso, a baritone guitar made by Tony Karol, and my 1930 National steel resonator guitar. When I was asked by the Narada label to be on their Masters of Acoustic Guitar compilation cd. Putting aside my personal belief that if one falls for the idea that one is actually a “master” of the guitar, one probably isn’t paying close enough attention—then, wow, how cool is that. Tell us about working with Kim Person. Kim is a wonderful engineer, and I started working with her in 1987. I’d just won the National Flatpicking Championship, and decided it was time to finally record something. I worked with her on every project from then on—up until I left Virginia in 2010. Everything I’ve recorded since then has still included her input. When I moved to Connecticut, I took the plunge and learned how to record myself. I’d never thought to do so before because with an engineer as talented and available to me, I figured—why bother? But when she was 450 miles away from me, rather than 15, I had to either develop a relationship with a new engineer, or learn to do it myself. I chose the latter—with Kim’s guidance. But I still send everything I record to her for tweaking—before it goes to mastering. Do you remember the first time you heard one of your compositions on the radio? I suppose you mean other than the Sunday afternoon in December a long time ago when I finished playing a brunch gig at a restaurant and was on my way to play at a private party. I turned on the radio and Christmas music came on. I don’t ordinarily listen to the stations that play only that music from Thanksgiving until New Year (laughs), but for some reason I did this particular day. A commercial came on and I realized that the background music was from my Nutcracker Suite for Guitar Orchestra . A second commercial then came on, and it also used different music from that recording. Nobody had asked me or informed me of such usage, so I was understandably surprised. So what was the other time? What PRO/Performing Rights Organization are you with? Best advice someone has given you that still helps you today? I’m still trying to figure it out. (Laughs) But in order to provide you an answer that’s at least marginally relevant, I’d say that I learned something valuable indirectly from Tommy Emmanuel: “Remember that if people are sitting in front of you and willing to listen, they have given you something—the gift of their ears, their time and their entertainment dollars.” It’s worth remembering. Not to say that one should be trying to please the crowd, necessarily. It’s more about always trying your best. Work hard and be nice to everyone you meet. It’ll do you no harm, and might well help a lot. Lunch. But seriously, I have more shows this year than I’ve had in a while—so that’s different. I haven’t really been looking for gigs in a while, preferring to stay close to home. Recording-wise, I have a few new tunes written and a few more percolating, so there’ll likely be something new later in the year. I hold out hope that the planned new national park in Gloucester, VA will come into existence because there’s a possibility that my orchestral work “The Powhatan Suite” could be performed by the Virginia Symphony. The park will be called Werowocomoco, the name of Powhatan’s village, his capitol, so to speak. The site of that village has only been confirmed in the years since I left Virginia. As it happens, I composed the Suite maybe 15 miles, as the crow flies, from Werowocomoco. The Symphony’s director likes the work—so who knows. But that would be an awesome thing indeed, to have that orchestral work performed live.